Former Arsenal striker Ian Wright rejected claims that Manchester City over-celebrated Sunday's derby win and played down the post-match row. United boss Jose Mourinho had milk thrown at him outside the Old Trafford dressing rooms after objecting to City's post-match celebrations. The Premier League leaders won the game 2-1 to go 11 points clear at the top. "It's just hilarious on so many levels, I don't think you can blame City," Wright told BBC Radio 5 live. "People are accusing them of not having class, they are saying you don't know how to act when you win, but you've got to take into consideration they have just broken a record, the 14 wins, against their biggest rivals." 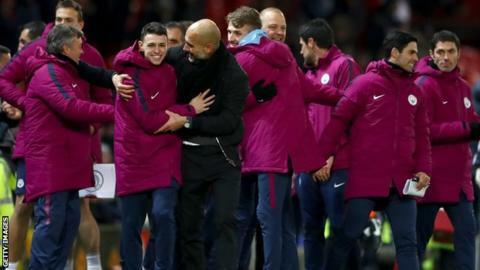 City's players celebrated in front of their fans after the final whistle, while the coaching staff tried, without success, to get coach Pep Guardiola to join them. After the players and staff then headed down the tunnel, it is understood Mourinho made his feelings known outside the visitors' dressing room as he made his way to post-match interviews. In the ensuing row the Portuguese coach had water and milk thrown at him, while City coach Mikel Arteta suffered a cut head after he was hit by a plastic drinks bottle. It is not known who threw it and sources from both clubs say no punches were thrown during the incident. Wright believes Mourinho should have used City's celebrations as a way to motivate his players to not give up the title battle just yet. Speaking on 5 live's Monday Night Club, Wright added: "There's a long way to go in the season. "Maybe Jose should have said can you hear that next door? Can you see what they're doing? We've got to make sure that we ram this back down their throats instead of turning it into 'Milkgate'. I find it hilarious." The Football Association announced on Monday that it will seek observations from both clubs in relation to the incident with the clubs having until 13 December to respond. The referee, Michael Oliver, did not see the incident and did not include it in his report of the match. Has Mourinho lost battle with Guardiola? Read more on Manchester United v City: Has Jose Mourinho lost battle with Pep Guardiola?